NOW AVAILABLE in an E-BOOK! How great is that! Every original chapter has been updated with new content. New chapters include Advanced Airway, Pharmacology & Medical Math. 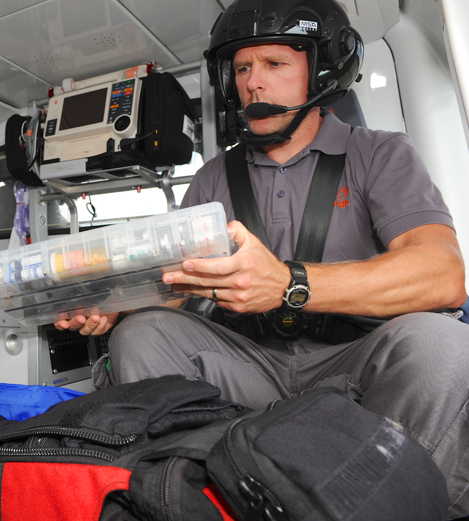 Brandon R. Doneff, BScN, Critical Care Flight Paramedic was born and raised on a tobacco farm in Delhi, Ontario. Brandon moved to London, got his BScN from Western University and his Paramedic Certification from Fanshawe College & Michener Institute. He worked as an Emergency Room Nurse, a Land Paramedic, and has been been a flight medic since 1995. He's still loving it! The adoption and application of the material offered in Medic’s Little Helper is at the reader’s discretion and sole responsibility. The author is not responsible in any manner whatsoever for any injury or malpractice that may occur directly or indirectly from the use of this book. No part of this publication may be reproduced or transmitted in any form or by any means, electronic, mechanical, photocopying, recording or otherwise without the written permission of the publisher. Book Design by Lima Bean Design co.